I attended a group education programme conducted by the Australian Diabetes council. The program ran for four successive Tuesday mornings starting from 3rd July 2012. There were eight sessions in all and the sessions were conducted by a diabetes educator, an exercise physiologist and a dietician. The sessions were on: education regarding type 2 diabetes, importance and types of physical activity with both theory and hands-on session, and diet and nutrition guidelines for persons with type 2 diabetes. Type 2 cases are those where the insulin making capacity of pancreas is not totally impaired. So these cases are normally treated with tablets where the pancreas is stimulated to produce enough insulin through tablets like diamicron (Gliclazide) or the body made to act more sensitive to insulin through tablets like Diabex (Metformin) or by a combination of both types of tablets. In certain extreme cases insulin may have to be administered daily either by injection or by insulin pump. At present type 2 diabetes is not curable, after onset, but its progression and onset of complications can be arrested by adopting a healthy life style and a good management programme. So physical activity and healthy eating along with periodic monitoring of blood glucose levels, become as much important as taking medicines regularly. Physical activity helps the absorption of insulin that can lower the blood glucose levels. Secondly it can lower the blood pressure and cholesterol levels, keeping the heart and blood vessels healthy, reducing the risk of diabetes complications. One of the important exercise programme demonstrated and taught in this session was the resistance exercises using thera-band. 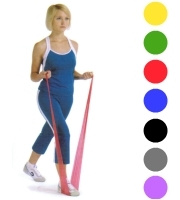 Thera-band is a natural resistance band made from rubber latex. The bands come at various resistance levels, from very light to heaviest, indicated by the colour of the band (see picture). Resistance exercise is a form of exercise that requires the muscles to move against a force such as weight or gravity. This helps by increasing basal metabolic rate i.e. the rate at which our body burns calories/kilojoules (1 calorie=4.184 kilojoules), improves joint function, increases bone density and reduces the risk of falls. This type of exercises can be supplemented by aerobic activities like walking, swimming, cycling or dancing etc. Healthy eating along with regular physical activity can help to manage the blood glucose levels, reduce fats in blood like cholesterol and manage body weight. A healthy food is one with less fat, especially saturated fat, and has high fibre, carbohydrate and is not of a large size. A regular routine of medium sized meals and small snacks spread evenly over the day is better than a routine of heavy meals at fixed times or any time of the day. Goal setting and monitoring form part of a good management programme. The goal should be a smart goal i.e., specific, measurable, achievable, realistic, with a timeline. Monitoring includes not only self-watch of blood glucose levels regularly but also annual examination of feet, eyes and gums, as these are served by capillaries which can be affected by long term diabetes.